Vibrant color and high contrast are the hallmarks of Rowan Chase paintings. His works, primarily landscapes and fluid abstracts, are informed by the undulating hillsides, broad ocean vistas and wild beauty of his home on California’s Central Coast. A resident of the area for more than 40 years, Chase was raised in a household that encouraged an appreciation of its natural surroundings. There was freedom to sleep under the stars, build forts and explore caves on the family’s sprawling acreage. Tools were available for fabrication and invention, and it was during this period of exploration and experimentation that the foundation was laid for Chase’s artistic pursuits. The artist began his career creating naturalistic shadowboxes and mobiles. In 2000 Chase founded the Fiona Bleu gallery to exhibit these three-dimensional and kinetic sculptures. The gallery also provided a studio space for Chase, who developed his skills as a painter working alongside his customers. Today the Morro Bay gallery displays his own work, as well as contemporary art, modern housewares and progressive design pieces by more than 50 artists. Rowan Chase Studio was established in 2010 with the launch of Chase’s lighting line. 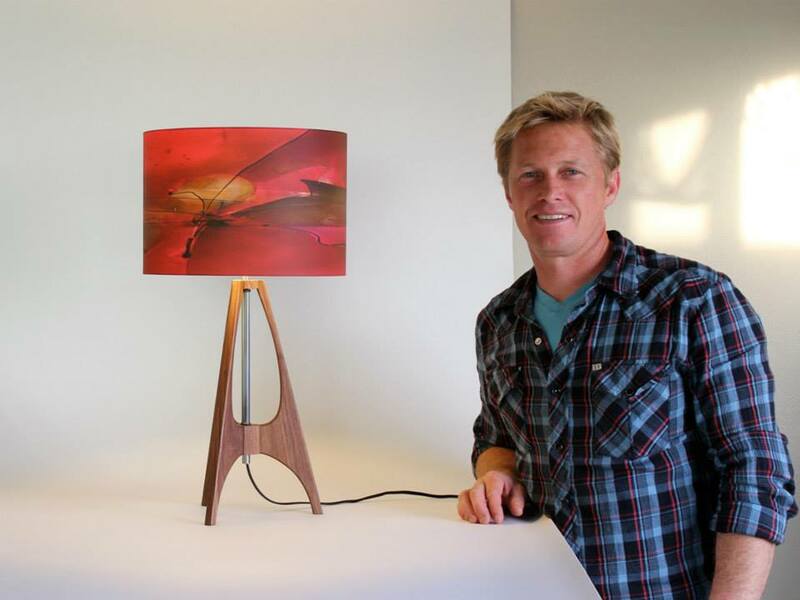 These handmade pendants, table and floor lamps feature designs from his portfolio and elegantly hewn solid wood bases. Chase plans to grow RCS’s offerings in the future, focusing on functional and decorative wares. Always pondering his next piece, Chase surfs and lives in Morro Bay with his wife, four children and Bailey, his snaggletoothed dog.